Accessible from the summit parking area at Brasstown Bald, this 5.6-mile trail follows along a wide path that was originally intended to be a part of GA 66. 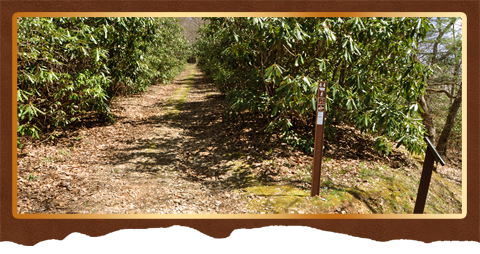 The trail is a little tricky to find, to reach the trailhead hikers will need to follow the Brasstown Bald Summit Trail for about 100-yards. The Wagon Train Trail is located on the right marked by a plaque. The stress rating for this trail is moderate to strenuous depending on if your going up or down the mountain. The trail either finishes or begins in the valley below just 2 miles south of the town of Young Harris GA. Even though the trail offers a grade suitable for a roadway I would recommend hiking the trail from top to bottom for a more enjoyable experience providing you have an extra vehicle waiting for you at the trails end. The trail offers great views especially in early spring or late autumn when views are less obstructed by leaves. The trail also follows past cliff formations and through upper boulder fields featuring rock tripe, lichens, club moss, reindeer moss and old man’s beard. Season wildflowers such as mountain buttercups, white and purple violets and four varieties of trillium to mention just a few, line the forest trail. The Wagon Train Trail was originally used for excursions by residents from the valley below to the mountain summit; it was a means of holding onto the past for the hardy descendents of the mountain pioneers. This quest to the mountaintop offered a sense of community spirit that stills echoes along the trail.